This week we celebrate the United Nations International Day of Cooperatives, commemorated every year on the first Saturday of July. Cooperatives’ success in sustainable development, wealth creation, and poverty alleviation give many hope for an equitable future. As we commend cooperatives, it is important to recognize and understand how they function. Cooperatives are largely based on the Rochdale Society in 1844 from England. In a time of terrible working conditions and low wages, this group of poor, English weavers struggled to buy basic goods, like flour. Without a rich, capitalist donor, the members all pooled their money to collectively purchase necessities. Their contribution earned them a say in the management of the association, and an equitable distribution of the net profits. Voluntary and Open Membership: anyone who can benefit and contribute can join. Democratic Member Control: members participate in policy and decision-making. Member Economic Participation: members contribute and manage the capital, the common property of the cooperative. Autonomy and Independence: members control the cooperative in agreements with other organizations, governments, or external donors. Education, Training, and Information: cooperatives give members life and work skills. Cooperation among Cooperatives: cooperatives ought to empower each other. Concern for Community: members sustainably develop their communities. Cooperatives have shown promise in developing their local economies. They produce the supplies and reap the rewards, making decisions that holistically benefit everyone. They act as an economic mover in democracy and civic society building, helping communities articulate their needs. They allow people to collectively compete in markets, and individually elevate their roles in the economy and society. In Morocco, the model most familiar to Westerners would be women’s cooperatives. Rural women have expressed a desire to work, earn money, and make decisions. By exporting fair trade handicrafts and products, they receive income where they were previously marginalized, unskilled, and relegated to household roles. For example, in the Ourika Valley, the Aboghlou Cooperative makes couscous and other dried goods. These 32 women got the capital necessary to grow almond seedlings for families and schools. In 2017, they also harvested and processed 60 kg of calendula flowers, selling to companies like L’Oreal. International companies are proud to support these cooperatives and affirm their ethical consumerism. This has been a veritable boon for the economy. 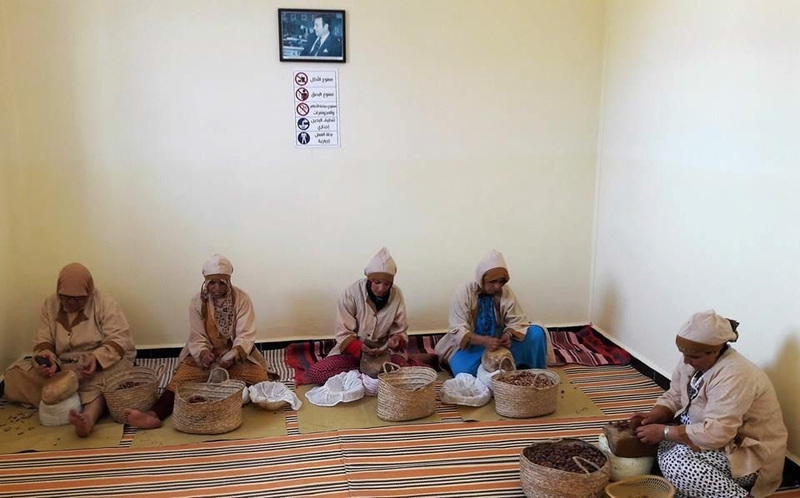 Additionally, Moroccan cooperatives like the Izourane Ouargane Women’s Cooperative produce and sell argan oil. By running a business and negotiating with Western cosmetic companies, the women earn and share both profit and respect. They learn through experience, growing more confident about how to manage a business. However, cooperatives are under threat from imposters and uncertainty. Foreigners that come to Morocco want to support women's cooperatives and buy their products, but they are worried about insincere businesses that abuse the label to trick them. Their concern lies in tourist traps where the women only have performative roles, such as publicly sorting the argan products, but do not have their fair share of control or profit. They know that untrustworthy middlemen exploit their sympathy for women’s development and empowerment. There is a broad asymmetry of market information in Morocco, especially for tourists. Sellers always have the advantage in knowing the true value of their goods, and in the souks, products are rarely branded, priced, or otherwise consistently labelled. Locals would have more expertise in discerning good quality materials from scams, but foreigners are more wary. Tourists are always pursuing authenticity in their new experiences, and want proof of legitimacy. Accordingly, there needs to be an international verification for cooperatives. Just as products need to meet a standard to be certified organic, enterprises that claim to be cooperatives ought to meet a standard to use the label. The ICA launched the Cooperative Marque in 2013, to emphasize the viability of the cooperative structure as professional and contemporary. An expansion of that could decidedly label cooperatives for being ethical and developmental. The Moroccan Office du Développement de la Coopération has a form for cooperatives to register themselves, but this information is not easily or ostentatiously available on products. Cooperatives that claim to help women should be examined and have more legitimacy on a global scale. Cooperatives have so much potential to sustainably lift people out of poverty. They can move people from subsistence agriculture to international commerce, bring communities together to capitalize on their shared resources, and improve living standards alongside economic opportunities. However, they need help. Cooperatives need assistance with facilitating dialogue and certification from an international standard. Cooperatives are founded upon trust between their members and the global public. While we celebrate them and all of the good they have done this week, let us support them as well. Amy Zhang (az2pj@virginia.edu) is an Intern with the High Atlas Foundation in Marrakech, and a student at the University of Virginia studying Economics and Middle Eastern Studies. 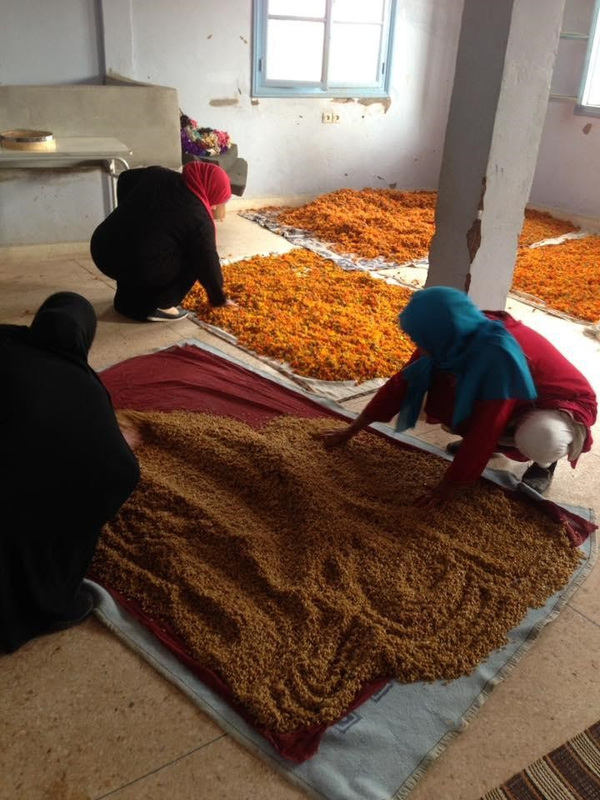 The Aboghlou Women’s Cooperative at work drying calendula flowers (photo by the High Atlas Foundation).